Chanslor Ranch spans 380 acres of hikeable land. We offer everything from easy walking paths, to steep hill trails. Take advantage of managed trails, or explore off-trail. Day hikers are welcome for a day-use fee. Hiking is free for those who book accommodation. Garden Path: Meets you in the parking area and takes you through our permaculture gardens and around the picnic area. 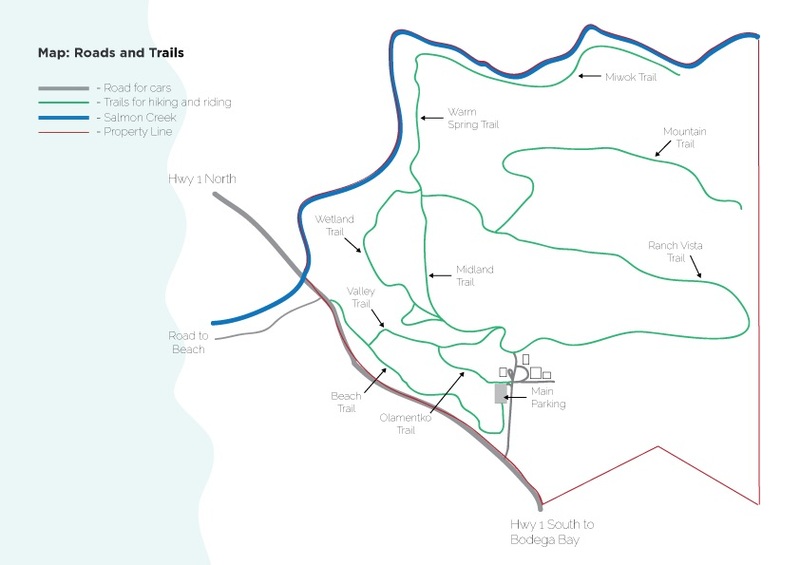 Beach Trail: Follows the fence line from the bottom of the parking lot, and takes you along Chanslor’s south bank toward Salmon Creek, where you will find a cross street that leads you to Salmon Beach. Intersects with Valley Trail. Ranch Vista Trail: Departs from Chanslor’s central area, and takes you up the first ridge of the Chanslor mountain-scape and follows the ridge around toward the river valley and the northwest trail system. Intersects with Mountain Trail, Warm Spring Trail, Wetland Trail and Midland Trail. Mountain Trail: Takes you up to the peak of Chanslor’s mountain-scape. Offers spectacular views and a mountain-top picnic area. Intersects with Ranch Vista Trail. Wetland Trail: Dips below Chanslor’s Midland Trail for a view of the Salmon Creek wetlands and river system. Intersects with Warm Spring Trail and Midland Trail. 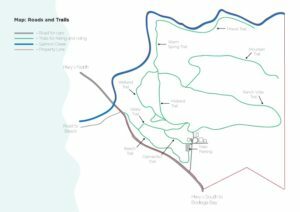 Warm Spring Trail: Takes you down into Salmon Creek valley and behind Chanslor’s mountains. Leads you to a small floodplain beach, where we offer kayaks and paddle boards for daily rental. Intersects with Miwok Trail. Miwok Trail: Leads you through Salmon Creek valley toward Miwok Village Site. Intersects with Warm Springs Trail. Valley Trail: Branches from Midland Trail and leads you through the ravine valley, past the Olamentko Sites and around the pond, where it intersects with Beach Trail. Midland Trail: Departs from Chanslor’s central area and leads you through the ravine valley and up along the midland ridge toward the river valley. Intersects with Warm Spring Trail. Olamentko Trail: Depart from the parking lot and leads you over the hill that overlooks Olamentko valley. At the bottom of the hill it intersects with Valley Trail.